Founded in 1865 by a group of Confederate veterans, the KKK rapidly grew from a secret social fraternity to a paramilitary force bent on reversing the federal government's progressive Reconstruction Era-activities in the South, especially policies that elevated the rights of the local African-American population. The name of the Ku Klux Klan was derived from the Greek word kyklos, meaning "circle," and the Scottish-Gaelic word "clan," which was probably chosen for the sake of alliteration. Under a platform of philosophized white racial superiority, the group employed violence as a means of pushing back Reconstruction and its enfranchisement of African-Americans. Former Confederate General Nathan Bedford Forrest was the KKK's first grand wizard and in 1869 unsuccessfully tried to disband it after he grew critical of the Klan's excessive violence. Most prominent in counties where the races were relatively balanced, the KKK engaged in terrorist raids against African-Americans and white Republicans at night, employing intimidation, destruction of property, assault, and murder to achieve its aims and influence upcoming elections. In a few Southern states, Republicans organized militia units to break up the Klan. In 1871, passage of the Ku Klux Act led to nine South Carolina counties being placed under martial law and thousands of arrests. In 1882, the U.S. Supreme Court declared the Ku Klux Act unconstitutional, but by that time Reconstruction had ended, and the KKK had faded away. 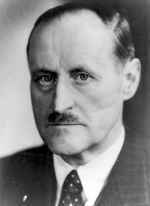 Hitler was Jewish with a Rothschild ancestor; Hitler had only one testicle; Hitler had two testicles, but one was bitten off by a goat; Hitler was a homosexual; Hitler once lived in Liverpool, England; Hitler was insane; Hitler was a great military leader; Hitler was a Pagan Mystic; Hitler was an omnivore; Hitler contracted syphilis from a French prostitute during World War I; Hitler was an artist; Hitler was a Draft Dodger; Hitler took Golden Showers on alternate Thursdays; Hitler knew nothing about the Holocaust and would have disapproved had he known; Hitler's 'real' name was Schicklgruber; Scientists have cloned Hitler's lip, and it's growing a mustache; Hitler never wanted war but was forced into it by an 'International Jewish/Marxist/Capitalist Conspiracy'; Hitler had foreknowledge of the Pearl Harbor attack; Hitler caused the Cold War; Hitler escaped his presumed death in the bunker and is at this very moment playing cards with Elvis. Marie and Pierre Curie successfully isolate radioactive radium salts from the mineral pitchblende in their laboratory in Paris. In 1898, the Curies discovered the existence of the elements radium and polonium in their research of pitchblende. One year after isolating radium, they would share the 1903 Nobel Prize in physics with French scientist A. Henri Becquerel for their groundbreaking investigations of radioactivity. Marie Curie was born Marie Sklodowska in Warsaw, Poland, in 1867. The daughter of a physics teacher, she was a gifted student and in 1891 went to study at the Sorbonne in Paris. With highest honors, she received a degree in physical sciences in 1893 and in mathematics in 1894. That year she met Pierre Curie, a noted French physicist and chemist who had done important work in magnetism. Marie and Pierre married in 1895, marking the beginning of a scientific partnership that would achieve world renown. Looking for a subject for her doctoral thesis, Marie Curie began studying uranium, which was at the heart of Becquerel's discovery of radioactivity in 1896. The term radioactivity, which describes the phenomenon of radiation caused by atomic decay, was in fact coined by Marie Curie. In her husband's laboratory, she studied the mineral pitchblende, of which uranium is the primary element, and reported the probable existence of one or more other radioactive elements in the mineral. Pierre Curie joined her in her research, and in 1898 they discovered polonium, named after Marie's native Poland, and radium. While Pierre investigated the physical properties of the new elements, Marie worked to chemically isolate radium from pitchblende. Unlike uranium and polonium, radium does not occur freely in nature, and Marie and her assistant Andre Debierne laboriously refined several tons of pitchblende in order to isolate one-tenth gram of pure radium chloride in 1902. On the results of this research, she was awarded her doctorate of science in June 1903 and later in the year shared the Nobel Prize in physics with her husband and Becquerel. She was the first woman to win a Nobel Prize. Pierre Curie was appointed to the chair of physics at the Sorbonne in 1904, and Marie continued her efforts to isolate pure, non-chloride radium. On April 19, 1906, Pierre Curie was killed in an accident in the Paris streets. Although devastated, Marie Curie vowed to continue her work and in May 1906 was appointed to her husband's seat at the Sorbonne, thus becoming the university's first female professor. In 1910, with Debierne, she finally succeeded in isolating pure, metallic radium. For this achievement, she was the sole recipient of the 1911 Nobel Prize in chemistry, making her the first person to win a second Nobel Prize. She became interested in the medical applications of radioactive substances, working on radiology during World War I and the potential of radium as a cancer therapy. Beginning in 1918, the Radium Institute at the University of Paris began to operate under Curie's direction and from its inception was a major center for chemistry and nuclear physics. 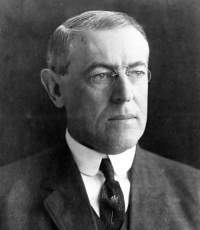 In 1921, she visited the United States, and President Warren G. Harding presented her with a gram of radium . . . .
1914 The Tabasco Incident: President Woodrow Wilson requests authorization from Congress to use military force to pressure Mexico. Note: Although not directly relevant to the First World War the so-called 'Tampico Incident' did play its part in subsequently straining US-German relations in early 1917. It is my duty to call to your attention to a situation which has arisen in our dealings with the General Victoriano Huerta at Mexico City which calls for action, and to ask your advice and cooperation in acting upon it. On the 9th of April a paymaster of the USS Dolphin landed at the Iturbide Bridge landing at Tampico with a whaleboat and boats' crew to take off certain supplies needed by his ship, and while engaged in loading the boat was arrested by an officer and squad of men of the army of General Huerta ... Admiral Mayo regarded the arrest as so serious an affront that he was not satisfied with the flag of the United States be saluted with special ceremony by the military commander of the port. The incident can not be regarded as a trivial one, especially as two of the men arrested were taken from the boat itself - that is to say, from the territory of the United States - but had it stood by itself it might have been attributed to the ignorance or arrogance of a single officer. Unfortunately, it was not an isolated case. The Lafayette Escadrille: a French squadron made up of American volunteers, flies in action for the first time on the Western Front. 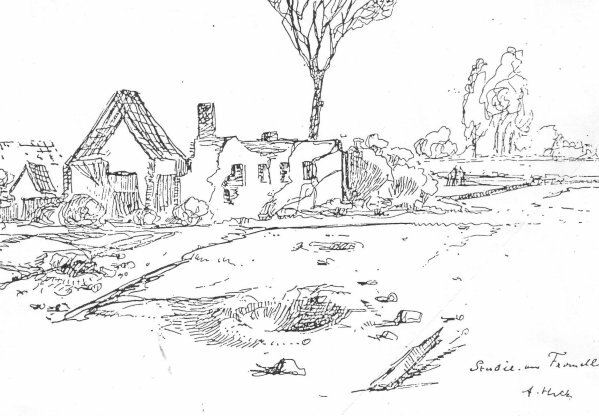 Nivelle Offensive ends in failure: An ambitious Allied offensive against German troops near the Aisne River in central France, spearheaded by the French commander in chief, Robert Nivelle, ends in dismal failure. Manfred von Richthofen—aka The Red Baron—shoots down his 79th and 80th victims marking his final victories before his death the following day. 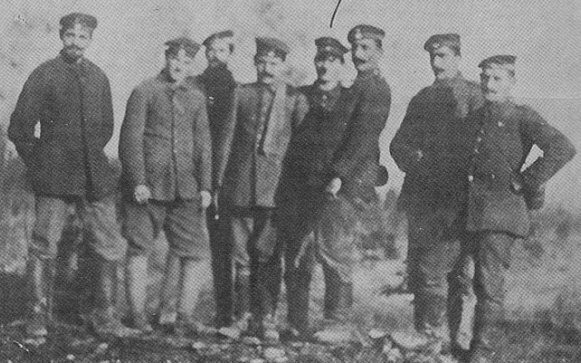 1919 Polish-Russian War: The Polish Army captures Vilna, Lithuania from the Soviet Army. Speirs parachuted into Normandy on June 6, 1944 (or D-Day) and quickly met with fellow troops at their makeshift command post at an empty farmhouse. He rounded up a few men, moved out, and helped in the capturing of the fourth 105 mm howitzer at the Brecourt Manor Assault. Soon after, rumors began circling that Speirs had killed twenty or thirty POW's after handing them cigarettes and giving them a light. Speirs has never denied nor confirmed the rumors. In 1958 he became the American Governor of the Spandau Prison in Berlin, the same place Rudolf Hess was serving his life term. 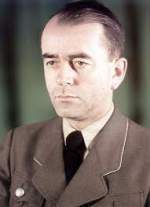 In Albert Speer's book, Spandau: The Secret Diaries he mentions a hard-nosed, irritating US Commandant, but not by name. This commandant has since been identified as Ronald Speirs. The speeches and articles which I wrote were meant to inform the public on a question which appeared to me one of the most important questions. I did not intend to agitate or inflame but to enlighten. Anti-Semitic publications have existed in Germany for centuries. A book I had, written by Dr. Martin Luther, was, for instance, confiscated. Dr. Martin Luther would very probably sit in my place in the defendants' dock today, if this book had been taken into consideration by the Prosecution. In the book The Jews and Their Lies, Dr. Martin Luther writes that the Jews are a serpent's brood and one should burn down their synagogues and destroy them . . . . 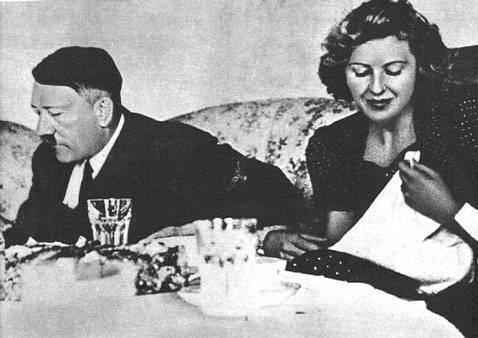 Even before the coming to power, there were, in every Gau, weekly journals that were anti-Semitic, and one daily paper called the V�lkischer Beobachter in Munich. Apart from that, there were a number of periodicals which were not working directly for the Party. There was also anti-Semitic literature. 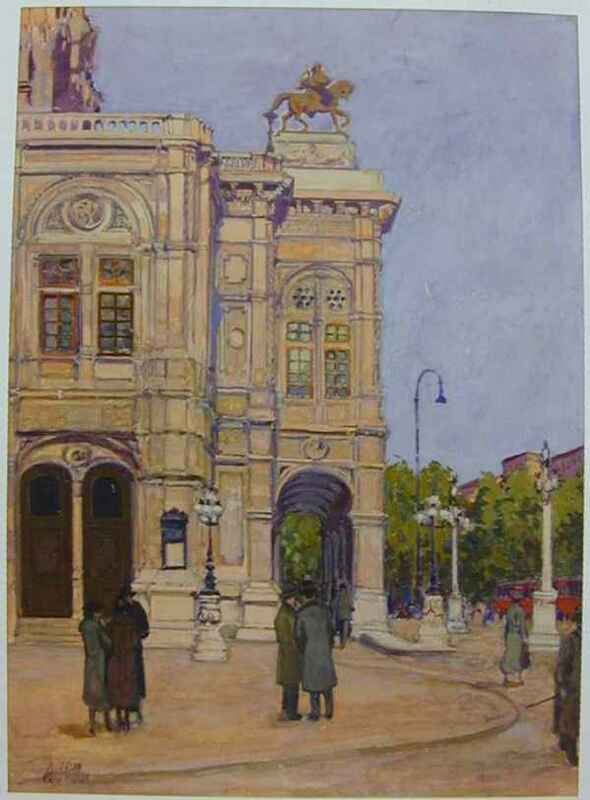 1923 In the evening of his thirty-fourth birthday, Hitler speaks on a well-worn theme, "Politics and Race: Why We Are Anti-Semites," before a crowd of 9,000 at the Circus Krone. 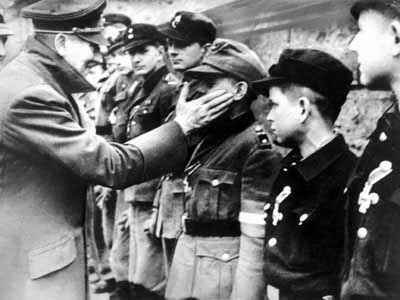 It is around this time that the 'Hitler Greeting'�Heil Hitler�begins to be heard among the already common 'Heils'. 1924 On Hitler's thirty-fifth birthday, while he is locked in a prison cell after the failed Putsch, is celebrated at Munich's B�rgerbr�ukeller "in honor of the man who had lit the present flame of liberation and V�lkisch consciousness in the German people." Shortly before twelve o'clock they would spread the cloth for dinner in the common room. This cloth didn't properly come under orders, but the convicts instituted it and we made no demur. They brought the meal in one large vessel and served it to the prisoners. As a rule the meal consisted of but one dish. Everyone waited for Hitler, each standing erect behind his own chair. When the leader appeared there was a cry of "tenshun! "and he strode to the top of the table, and remained standing, until every man in turn came forward with his table-greeting. Then all sat down and fell to. I used to "take" Hitler's visits in a room set apart for the purpose . . . . In the course of so many but so brief interviews Hitler developed an extraordinary terseness and fluidity of expression. It often went severely against the grain to me to bring these to a close. The moment, however, I made a sign that time was up, Hitler broke off, and withdrew . . . . It was really a wonderful experience to listen to Hitler in face-to-face conversation. I don't know anyone whose personality was so overwhelming. As a rule when I had to "take" one of these visits, I made a point of having a newspaper on hand, in which for appearances" sake I could appear to immerse myself. Very often, though, I just used it to screen the intense interest I myself was feeling in the conversation. Hitler's way of putting things was not mere talking: he made you feel the point come right home: you yourself experienced every word . . . . throughout his whole ten months [including pretrial confinement], Hitler never talked to us officers directly on the subject. Yet I don't think I should be off the mark if I were to say that before we saw the last of him everyone here, from the Governor to the furnace man, had become a convinced believer in his ideas. 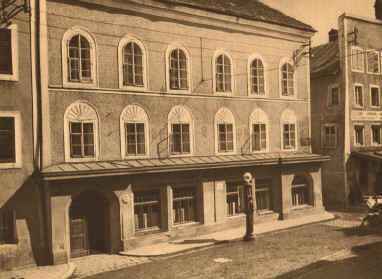 1924 In response to a March 26 inquiry by Bavaria, Austria officially confirms Hitler's Austrian citizenship and states that he will be allowed entry into Austria at Passau should he be deported from Germany. While there will be some problems in Austria concerning this issue, with some confusion created at the Passau border station as to whether Hitler was or was not actually approved to enter there, the main point is that at no time is his status as an Austrian citizen altered. This state of affairs leaves open the possibility that he could be legally deported at any time. We celebrate Hitler's birthday. He is thirty-seven. Flowers surrounded by thirty-seven candles. And he talks about November 9, 1923. Adolf Hitler, I love you, because you are both great and simple. A genius! Leave-taking from him. Farewell! He waves. I grant audiences. Hitler celebrates his 50th birthday with the largest military display in German history, as representatives of the US, Britain and France look on. Naval Supreme Commander with Fuehrer. Navy Supreme Commander asks about result of Matsuoka's visit and evaluation of Japanese-Russian pact . . . . Fuehrer has informed Matsuoka 'that Russia will not be touched if she behaves in a friendly manner according to the treaty. Otherwise, he reserves action for himself.' Japan-Russia pact has been concluded in agreement with Germany and is to prevent Japan from advancing against Vladivostok and to cause her to attack Singapore. Hitler's Birthday: "You who carry the flags and banners and who march behind them, remember that you are fighting for the greatest cause that Germans have fought for in a thousand years, and do not forget who also gave you the symbol that goes with the idea: Hitler!" -Alfred Rosenberg. 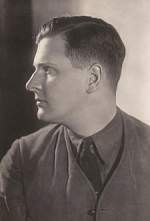 The Soviet Government agrees that it is essential to arrange a meeting between V.M. Molotov and you for an exchange of views on the organization of a second front in Europe in the near future . . . . It goes without saying that Molotov will also go to London to exchange views with the British Government. I have no doubt that I shall be able to have a personal meeting with you, to which I attach great importance, especially in view of the big problems of organizing the defeat of Hitlerism that confront our two countries. Please accept my sincere regards and wishes for success in the struggle against the enemies of the United States of America. Tiger (tank): The first prototype of (P) is completed in time for a demonstration on Hitler's birthday. However Tiger (P) will encounter serious complications and manufacturing will have to be suspended many times. The longer the war lasts, the lower my esteem for the generals sinks. Admittedly, they have professional ability and physical courage, but little moral courage, absolutely no over-all or international view. Nor have they the least spiritual or intellectual independence or resistance based on true culture. They are accordingly unable to deal with a man like Hitler and absolutely at his mercy. In addition, the majority regard career in the worst sense, money and the field marshal's baton, as more important than the great principles and moral values that are at stake. All those on whom hopes had been set have proved worthless. And in the most miserable fashion: they agree to everything one says to them and join in the wildest plans but cannot summon up the courage to act. I beg of you, my Fuehrer, to give me a chance during my next audience to report to you orally on the whole extent and state of this art-seizure action. I beg you to accept a short, written, preliminary report of the progress and extent of the art-seizure action, which will be used as a basis for this later oral report, and also to accept three volumes of the provisional picture catalogues which, too, show only a part of the collection at your disposal. I shall deliver further catalogues, which are now being compiled, as they are finished. These photos represent an addition to the collection of 53 of the most valuable objects of art delivered some time ago to your collection. This folder also gives only a weak impression of the exceptional value and extent of these objects of art, seized by my service command (Dienststelle) in France and put into a safe place in the Reich. I shall take the liberty during the requested audience to give you, my Fuehrer, another 20 folders of pictures with the hope that this short occupation with the beautiful things of art, which are so near to your heart, will send a ray of beauty and joy into your care-laden and revered life. 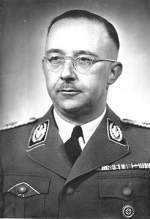 Warsaw Ghetto Revolt: Himmler promises to crush Jewish resistance, remarking that dead Jews will make a fine birthday present for Der Fuehrer. As soon as the units had entered, strong concerted fire was directed at them by the Jews and bandits. The tank employed in this operation and the two SPW [heavy armored cars] were attacked with Molotov cocktails. The tank was twice set on fire. This attack with fire by the enemy caused the units employed to withdraw in the first stage. Losses in the first attack were 12 men (6 SS men, 6 Trawnicki men). About 08.00 hrs. the units were sent in again under the command of the undersigned. Although there was again a counterattack, in lesser strength, this operation made it possible to comb out the blocks of buildings according to plan. We succeeded in causing the enemy to withdraw from the roofs and prepared elevated positions into the cellars, bunkers and sewers. Only about 200 Jews were caught during the combing-out operation. Immediately afterwards shock-troop units were directed to known bunkers with orders to pull out the occupants and destroy the bunkers. About 380 Jews were caught in this operation. War with Japan: US B-29 bombers destroy the Musashi Aircraft plants, halting production of Nakajima Ki-84 fighter planes. Eastern Front: Marshal Ivan Konev's 1st Ukrainian Front breaks through the last formations of Army Group Center. Soviet tanks reach the outskirts of Berlin. 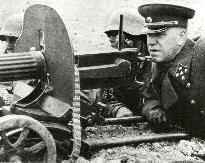 Marshal Georgy Zhukov's 1st Belorussian Front begins shelling Berlin's Zentrum. German defences, most of which are commanded by Helmuth Weidling, consist only of a couple of depleted and poorly equipped Wehrmacht and Waffen-SS divisions, supplemented by Volkssturm and Hitler Youth members. 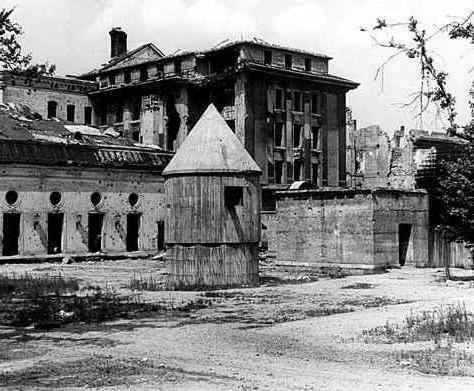 Meanwhile, US troops capture Leipzig, Germany, but will later have to hand the city over to the Soviets. The most impressive false news of which I was a victim was given out in the last few days of the war. I must describe it for the sake of clearing up matters. In the days when Berlin was surrounded by the Russian Army the people of Berlin were told that a relief army, the army of General Wenck, was marching on Berlin; that there was no more fighting on the Western Front. The news was given out that Ribbentrop had gone to the Western Front and had concluded a treaty there, and handbills were printed in Berlin which contained approximately this text: "Soldiers of the Wenck army, we Berliners know that you are as far as Potsdam. Hurry, come quickly, help us." These handbills were printed at a time when the Wenck army no longer existed and had already been captured. These handbills were apparently dropped over Berlin inadvertently and were to give the inhabitants of Berlin new courage. 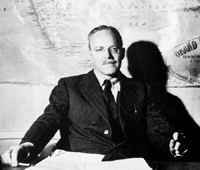 That happened in the days when Hitler, according to Speer's testimony, had already told his entourage that there was no use trying to do anything for the rest of the German people. Operation Corncob is launched: Allied bombers in Italy begin a three-day attack on the bridges over the rivers Adige and Brenta to cut off German lines of retreat on the peninsula. Holocaust: A Gestapo reign of terror results in the hanging of 20 Russian prisoners of war and 20 Jewish children: Of these, at least nine are under the age of 12. All of the victims had been taken from Auschwitz to Neuengamme, the place of execution, for the purpose of medical experimentation. Hitler celebrates his 56th birthday in his Berlin bunker: With the Russians at the gates of Berlin, the increasingly deranged dictator receives the murmured birthday greetings of his entourage with a limp handshake and a vacant expression. Present to wish their Fuehrer well are Goering, Goebbels, Himmler, Speer, Doenitz, Ribbentrop, Keitel, Kaltenbrunner, and various generals. I can see you would like me to be more positive about Hitler. But if I'm to write honestly, I cannot do that. That would really be falsification of subjective[sic] truth. This kind of embellishment happens to most writer of memoirs which, probably unconsciously, they repress the negative aspects of their lives or the events they describe . . . . Perhaps this is what is happening already now in our country and to our people. It is, in the final analysis too painful to face that one has sacrificed children or parents for ideals one can now only condemn. I fear that, just as happened after Napoleon's fall, when for a long time only negative opinions were voiced, this restraint may repeat itself here—just as happened then—result in a historical rebound, with German historians fifteen or twenty years from now presenting a Hitler repainted in positive colors . . . .
You criticize me for calling Hitler a criminal and you are of course right that, as this is a value judgement which the reader should make for himself, it is appropriate in a book of memoirs. But if I say it, not once but many times, then I do so deliberately, in a way to remind myself. Of what? 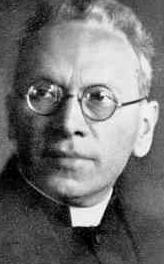 Of what I learned so graphically in Nuremberg: that upon his orders families—yes, imagine it, families—a man with his wife and small children—had to die [mussen in den Tod gehen] just because they were Jews. 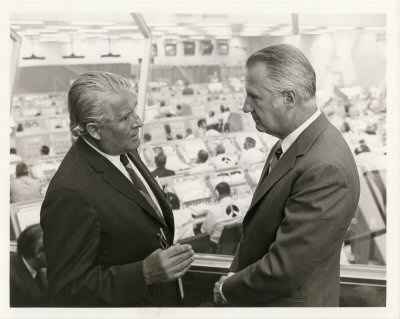 Being myself the father of young children, I have sufficient imagination to picture myself in their place . . . .
Do we have a chance of beating the Soviets by putting a laboratory into space, or a trip to the moon, and back, with a man? Is there any other space program which promises dramatic results in which we could win? 1998 The German terrorist group Red Army Faction announces its dissolution after 28 years: The RAF operated from the 1970's to 1998, causing great civil unrest, especially in the autumn of 1977, which led to a national crisis that became known as "German Autumn." It is responsible for 34 deaths including many secondary targets such as chauffeurs and bodyguards and many injured in its almost 30 years of existence.